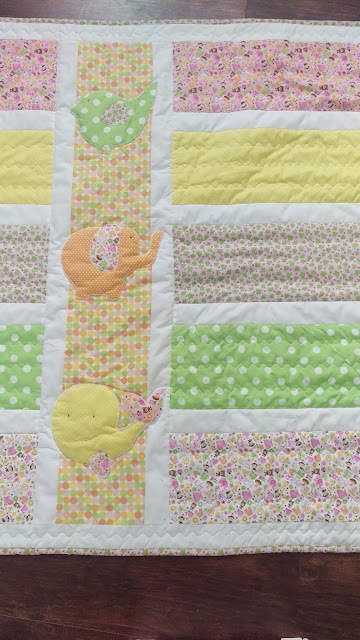 This is the same pattern as the easy baby quilt. The only difference is the added applique and I cut all the white to 2 1/2" wide in order to have a bigger quilt. Hey! I finally finished my fantastic Low-volume bedspread! About three years ago my daughter gave me a huge stack, (sixteen, in fact) of fat quarters. After months and months of pondering what style and looking for extra fabric for borders this is what I came up with. Oh yes, I also unpicked several times before I finally had a design I loved! My friend said I should just stick to quilt kits instead of trying to create my own....I don't know, I really enjoy playing around with fabrics and designs even though there are many 'do-overs'.